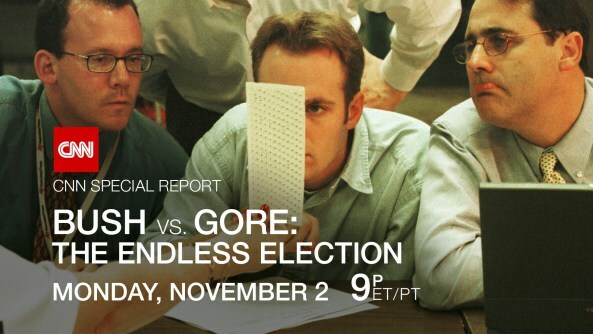 CNN will air a special report, Bush vs. Gore: The Endless Election, hosted by CNN’s chief political analyst Gloria Borger on November 2 at 9pm ET in a “retelling of election 2000,” 15 years after it happened. It was an election night that ended with epic confusion as networks called the key swing state of Florida for both Gore and Bush – and the uncertainty soon escalated into 36 days of dramatic combat for the oval office. In the retelling of election 2000 – 15 years later – CNN Chief Political Analyst Gloria Borger takes viewers inside the war rooms, control rooms and campaigns. With perspectives from NBC Anchorman Tom Brokaw to Vice Presidential Candidate Joe Lieberman – and others – the stories are told by those who lived through it, and provide a candid look at the bare-knuckle brawl happening behind the scenes. The strategies, the mistakes and the maneuvering that ultimately landed George W. Bush in the White House – and changed the course of history. The story begins with election night 2000. (“I was just seeing my life kind of flash in front of me and kind of breaking out into a sweat thinking oh my god, what do we do here?” says Bill Daley, Gore Campaign Chairman.) It moves to the battle to win Florida, a state whose governor, Jeb Bush, was George W. Bush’s younger brother. (“We were going to fight them tooth and nail, house to house, hand to hand, and we were going to hold Florida unless they sent in federal troops,” says Mac Stipanovich, an adviser to Katherine Harris, the Florida secretary of state.) And the final act is played out at the Supreme Court, a decision that is still controversial. “Bush vs. Gore” was produced by Brian Rokus. Wade Payson-Denney was the Video Producer. Dani Sloan was the Production Assistant. Jen Hyde is the Executive Producer. Michael Bass is the Executive Vice President of Programming.